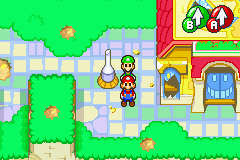 Mario and Luigi wandering the city in ruins. 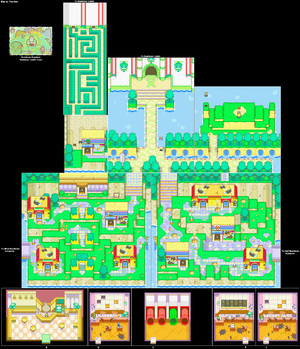 Beanbean Castle Town is the central location in the Beanbean Kingdom. It appears in Mario & Luigi: Superstar Saga. In the north part of town is a castle where Queen Bean lives with her son, Prince Peasley, her ambassador Lady Lima, and many Peas. The Beanbean Castle Town has a cafe that E. Gadd owns. It also contains four shops, one for items, one for Clothing and Badges, an Information Booth, and a photography service shop at the right side of Beanbean Castle Gates. The player can have their picture retaken there. 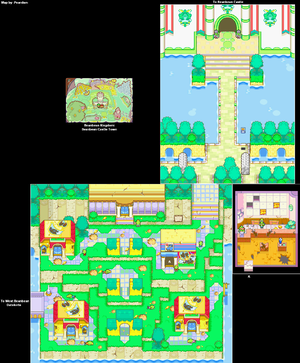 In Mario & Luigi: Superstar Saga + Bowser's Minions, Beanbean Castle Town is seen in Minion Quest: The Search for Bowser, where Fawful is seen attacking the town using Mecha-Fawfuls. The town is found destroyed when first arriving. After returning from Chucklehuck Woods and curing Queen Bean, the town is seen repaired. After Luigi steals the Beanstar from Bowletta, she attacks the town, destroying it once again. When Mario and Luigi first arrive, they see that the town has been attacked by Cackletta the evil witch, with Fawful. Mario and Luigi were late, since Cackletta had already kidnapped the Beanstar and poisoned Queen Bean with a Belly Blech worm. After Mario and Luigi fought Queen Bean, and cured her with Chuckola Reserve, the town was fixed once again. However, after Mario and Luigi defeat Popple and Birdo in Teehee Valley, the town was once again destroyed by Bowletta (after she lost the Beanstar again to Luigi). The town is not seen again after Bowletta's demise. Any side-quests not finished before coming back to Beanbean Castle Town after falling from the Koopa Cruiser cannot be completed again for the rest of the game. 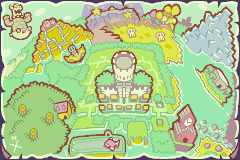 The area around Beanbean Castle Town has numerous Warp Pipes. Warp Pipes #2, #4, and #6 can be found in North, South, and East Beanbean, respectively. 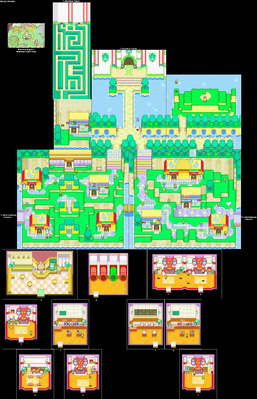 Beanbean Castle Town itself contains Warp Pipe #3, specifically in the Pipe House. Mushroom In the west screen, in a ? Block in the southeast building. Super Mushroom In the east screen, in the fourth ? Block in the north building. Golden Mushroom Given by the young dude in the south of the east screen after finding 5 Beanlets for him. Syrup Jar In the east screen, in the second ? Block in the north building. Hoo Bean In the east screen, in the first ? Block in the north building. In the east screen, in the third ? Block in the north building. Bros. Rock Given by the elder in the southeast of the west screen after finding 10 Beanstones for him. Beanlet In the west screen, behind the building in the northwest. In the west screen, on the roof of the building in the southwest. In the west screen, on the roof of the building in the southeast. In the east screen, in the northeast corner. In the east screen, on the roof of the big building in the north. Beanstone In the west screen, in the southwest corner. In the west screen, in front of the south arch. In the west screen, to the northeast of the broken arch in the center. In the west screen, to the right of the north arch. In the west screen, in front of the fashion shop in the northeast. In the east screen, in the southwest corner. In the east screen, on the rightmost hill in the south. In the east screen, in front of the stairs in the northwest. In the east screen, to the southwest of the big house in the north. In the east screen, to the right of the tree in the northeast. For a list of hidden blocks found in Beanbean Castle Town, see here. German Bohnenburg Portmanteau of the German words Bohne (bean) and Burg (castle). This page was last edited on December 11, 2018, at 01:07.